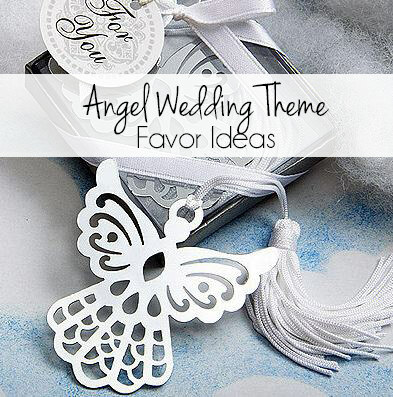 Finding angel wedding theme favor ideas for a heavenly wedding can be easy with these great options. You can use angels in a variety of ways when designing a wedding theme that fits your personality and the sentiment of the love you share with someone special. You may think of fairies and angels flying through the air in a whimsical manner. You may use cartoon character angels or angels with long, flowing white gowns and glowing halos. Mythical angel is another theme that can lead to a unique, unforgettable wedding. 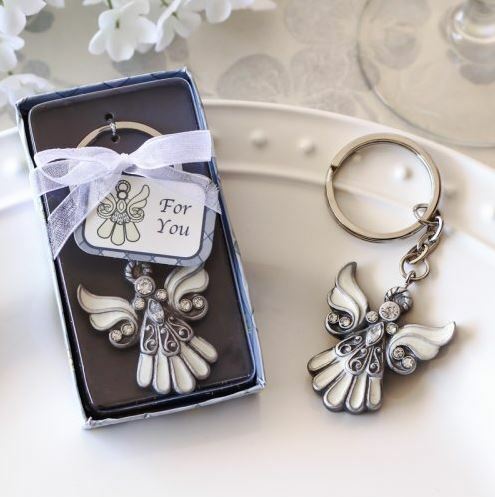 Whatever the picture in your mind when you think of angels, there are a variety of angel wedding theme favors that will bring your special day alive. 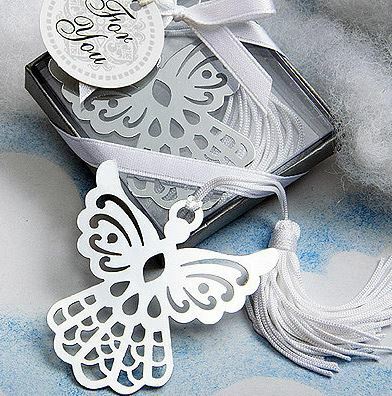 Use these favors to add elegance and romance to your wedding ceremony or reception, but be prepared to let them fly out the door with your guests as your guests will enjoy them immensely. 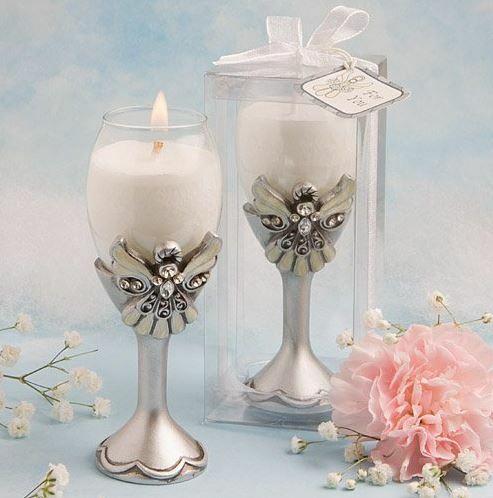 The following angel wedding favors and decorative items will keep memories of your wedding in the minds of your guests for months to come. 1. Angel Wing Key Chains: These poly-resin key chains feature angel wings that can be used in a traditional or whimsical manner. Regardless of the type of angels you are inviting to your celebration, you will find these wings fit right in. 2. Angel Mint Tins: These elegant, 2-inch black and white tins will deliver a supply of mints for guests of all ages. They are also functional items that many guests will find useful after the wedding is over. 3. 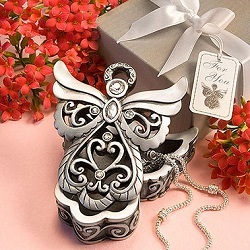 Angel Curio Boxes: You can leave these elegant boxes empty for your guests to fill with their own treasures later on, or hand them out with charms or jewelry for special wedding guests. This is a wedding favor that no guest will forget. 4. 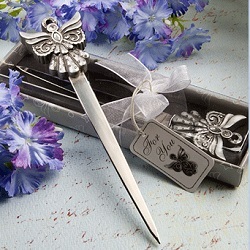 Angel Letter Openers: This is a unique wedding favor idea because most people no longer have letter openers around the house. You may also want to take the time to write a personal note to all of your guests and seal them in envelopes, ensuring each guest uses their opener at least one time. 5. 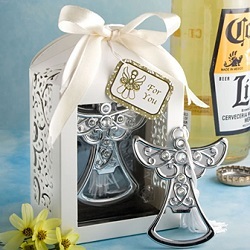 Angel Bottle Opener Favors: Send the angels away with your guests as they visit your wedding bar, or simply set these openers on the tables for your adult guests. 6. Angel Bookmark Favors: Let the angels dangle between the pages of books that make a difference in the lives of your loved ones. These bookmark favors are adorable, and they will bless the lives of every bookworm you love. 7. 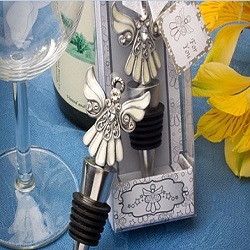 Angel Wine Bottle Stoppers: These cute little angels will come in handy at the reception, but they will help your guests pop the bubbly on other special occasions as well. Consider handing them out at your reception bar or adding them to gift bags for select guests. 8. Angel Candle Holders: Use these adorable candle holders as decorative elements at your reception, or simply send them home to add a touch of elegance in other settings. This is an attractive favor idea that your guests won’t want to throw away at the end of the night. 9. 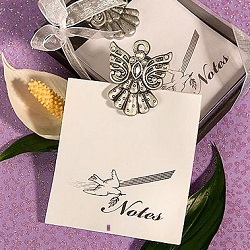 Angel Memo Pad Favors: Let the angels forever watch over your personal notes and phone messages. This is a simple favor idea that you can use in many decorative ways.